The Volusia County Council will unveil a state historical marker for the Volusia County Historic Courthouse at 12:30 p.m. Tuesday, April 16, on the Indiana Avenue side of the courthouse. A second, identical marker will be placed at the New York Avenue entrance. Speakers will include Retired Circuit Judge Edwin P.B. Sanders, Volusia County Chair Ed Kelley and Historic Preservation Board Member Zach Zacharias. After the ceremony, volunteers from the Museum of Art – DeLand and the Seventh Judicial Circuit will conduct tours of the courthouse with emphasis on the artwork, architecture and the original courtroom. The county’s Historic Preservation Board and the Parks, Recreation and Culture Division obtained the markers through the Florida Historical Markers program, which was created in 1960 to increase public awareness of the state’s rich cultural heritage and to enhance the enjoyment of historic sites by residents and tourists. Completed in 1929 for a cost of $500,000, the courthouse was described as “one of the most beautiful county administration buildings in the South.” It featured fluted Corinthian columns, vaulted arches, marble staircases, a distinctive copper clad dome, and an interior cupola featuring a stained glass dome. Additionally, it had elaborate twin facades containing ornate balustrades and terra cotta entablature. The dedication ceremony on Nov. 18, 1929, was attended by more than 3,000 locals who enjoyed a pork barbecue, concerts from the Stetson University Orchestra and the DeLand Concert Band, and circus performers provided by the Johnny J. Jones Show. 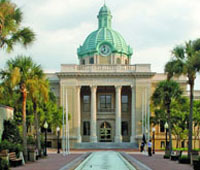 In 1987, the Volusia County Courthouse was listed on the National Register of Historic Places as a part of the Downtown DeLand Historic District. Volusia County completed a lengthy restoration project in 2005, restoring the popular landmark to its former glory.